Payment options: CASH and all major credit cards (Mastercard, Visa, Discover, AMEX, Apple Pay and Google Wallet). Please note, the Fox Memorial Clinic is not scheduling surgeries at this time. 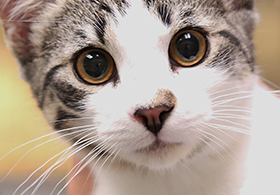 The Connecticut Humane Society’s Fox Memorial Clinic has been giving pets and their families access to quality and compassionate care since 1999. Fox’s fees for services are generally 20-30% lower than most veterinary hospitals. Donor support makes the clinic’s mission possible. Fox delivers preventative healthcare to protect pets from disease and injury, and offers diagnostic and treatment services. It also holds vaccination clinics twice a month.